If you love the flavor grape, you are going to love this grape smoothie! Grapes are known to have a lot of health benefits due to the high amount of antioxidants they contain. Grape juice gives this healthy smoothie a strong grape flavor as a base to which fresh grapes are added. The yogurt and banana give this smoothie a nice, thick texture. If you like your smoothies on the cold side, you can freeze the banana and grapes ahead of time before using it in the smoothie. For best results, use a grape juice that is not from concentrate (you can find this at health food stores). Add all ingredients to a Magic Bullet cup and blend until smooth. There’s something about a tart grapefruit that puckers your taste buds in just the right way. This grapefruit slushy is not too tart, not too sweet, and just the right amount of satisfying. 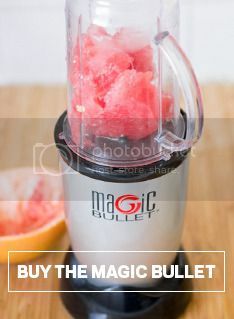 Combine grapefruit slices with ice and sweetener in Magic Bullet and blend. That’s it! Taste to make sure sweetness is where you want it (start small and work your way up!). One of my favorite ways to use up kiwis that are getting too ripe and soft is by adding them to a strawberry peach smoothie for breakfast. In this refreshing breakfast smoothie, I use frozen peach slices and strawberries for the slushy effect, plus fresh kiwi, oats and yogurt to make it a well-balanced breakfast. I personally like to only add some water to get things moving instead of fruit juices, but adding orange juice or any other fruit juice will sweeten this smoothie up. This recipe combines broccoli with blueberries and banana to produce one of the most deliciously healthy smoothies you’ve ever had. The sweetness of the fruit is just the right thing to balance out the broccolis earthiness. Combine milk, water, banana and oats in Magic Bullet and blend until mixed together. Add remaining ingredients to Magic Bullet and blend. How versatile is a mango? You can eat it on its own, in a taco, as a garnish, and with the help of the Magic Bullet and an incredibly simple recipe like this, as the headliner in a delicious and refreshing drink! This recipe combines mango with just a touch of lime to create the perfect drink for mango lovers. And it’s so easy to make! Cut half a mango into chunks and add to Magic Bullet, along with water and a splash of lime juice. That’s it! Who knew such an exotic drink would be so easy to make? There’s nothing quite like a natural drink with a subtle sweetness to refresh you as weather starts to warm up. This banana agua fresca is unique, tasty, and full of natural goodness. And, it’s easy to make! Combine all ingredients in Magic Bullet and blend. Chill before serving. Be ready to want to make two or three more batches! For those of us who have a tough time getting into “meal-mode” after a workout, a hearty smoothie can be so valuable. It provides necessary vitamins, keeps your energy up, and doesn’t require a fork and knife. This smoothie recipe is chock full of tasty and hearty ingredients: it combines peaches, protein powder, yogurt, spinach, milk and cereal (that’s right, cereal!) to build the perfect post-workout meal. Chop peaches and blend in Magic Bullet. Add remaining ingredients to peach mixture and blend until smooth. Breakfast in a cup never tasted so good! There is something about this warming weather that has me craving cold, citrus drinks. The other day my coworker brought in an orange smoothie from Jamba Juice, and it inspired me to make this mandarin smoothie from scratch at home with my Magic Bullet. This mandarin smoothie is incredibly refreshing, and made with simple, delicious ingredients. It is important to freeze the mandarin slices ahead of time, which will make this smoothie slushy after you blend all of the ingredients together. All you need to make this mandarin smoothie is a cup of mandarin slices (already frozen), crushed ice, and your choice of milk (regular, almond, coconut, etc. ).